Continuing our series about going digital with your bookkeeping, from a small business owner’s perspective, did you know you can enter your expenses and create sales invoices from your mobile phone with the new MTD compliant software? Hear from local small business owner, Louise, how she finds using her smart phone app. I tried to download the HMRC tax app about a year ago and couldn’t make much sense of it, so I was sceptical about using a bookkeeping app. However, Claire assured me that the new breed of Making Tax Digital compliant apps are actually really easy to use. Having now tried it myself … it turns out she was right. My usual way of dealing with expenses is to stash receipts away in my desk drawer, promising myself I’ll deal with them later. Any invoices I’m sent for things like my web domain renewal or software I’ve purchased often get lost in my email inbox. By the time I come to send them to my accountant there’s always a handful of receipts I’ve lost and it takes me ages to cross reference them with my bank statements to find out which ones are missing. Claire’s suggestion to make my life easier is to download the bookkeeping app to my smartphone. All the major cloud accounting software providers now offer an app, so you can benefit whether you use Xero, Sage or QuickBooks. Once you download the app to your phone you log in with your cloud accounting log in details and you can see all your transactions. The thing I love most is entering my expenses for train tickets from the train just after I’ve bought the ticket. All I need to do is enter the amount, take a photo of the receipt and check the account code. The app saves it all and I now can’t lose the receipt because I have a digital copy. The software is pretty clever, so if I type in the reason for the expense it usually guesses the right account code (Travel, Entertainment, Printing). 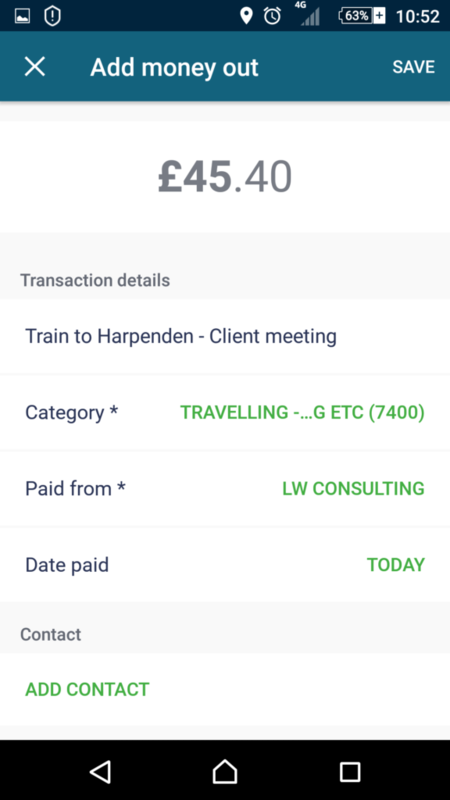 I can also enter sales invoices from my phone and get a handy view on which ones are already sent to the client, which are paid and which are outstanding. So I can check when I get a few minutes waiting for the bus in the morning, instead of having to find time to sit down and go through my paperwork once I get home. My new resolution, then, is to keep my books up to date as I go, using my smartphone and keep digital copies of all my receipts and invoices (you can upload pdfs as well as take photos) so I never have to panic about finding them all just before the Self Assessment deadline. The new software should make it easier – I have got absolutely no excuses to put it off now.